The 8th arrondissement is the primary business district of Paris and home to world-famous attractions like the Arc de Triomphe and the Champs-Élysées. Also filled with world-class hotels, lavish restaurants, and luxury boutiques, all along the right bank of the Seine, the 8th is one of the most luxurious neighborhoods in Paris. 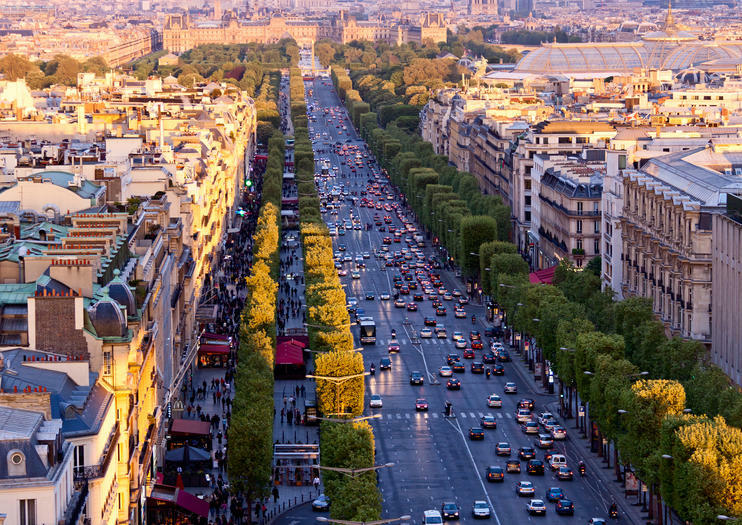 No first-time visit to Paris is complete without a stroll down the Champs-Élysées. The best way to experience it and the 8th arrondissement attractions is on foot, so elect for a guided group or private walking tour. You can also explore on your own with a Paris hop-on hop-off bus tour. Make sure to climb to the top of the iconic Arc de Triomphe for fantastic views down the Champs-Élysées, and don’t miss the historic Grand Palais and Place de la Concorde. The 8th arrondissement is a must for all first-time visitors to Paris. This is one of the busiest districts of Paris, so be prepared for crowds, especially during the peak summer season. Save time standing in line at top sights by booking admission tickets and tours ahead of time. The Champs-Elysées and Arc de Triomphe are accessible to wheelchair users. The 8th arrondissement is easily accessible by public transportation including many metro lines; Line 1 runs along the Champs-Élysées and traverses the entire city from east to west. The 8th also has two RER stations, Charles de Gaulle–Étoile and Haussmann–Saint-Lazare, that service outlying areas of Paris. There is really no right or wrong season to visit Paris. In summer, venture out early in the morning to see the city with fewer crowds. During the festive season, seeing the Champs-Élysées lit up with thousands of twinkling lights makes for a particularly memorable holiday experience. The Champs-Élysées is Paris’ most famous thoroughfare, and many of the city’s most popular sights are located on or around it. The boulevard is only 1.9 kilometres (1.2 miles) long, so you can easily walk the entire length—from the Arc de Triomphe to Place de la Concorde—admiring luxe shops and must-see landmarks such as the Luxor Obelisk, the Petit Palais, and the Grand Palais along the way. Discover some of the finest architecture in the French capital on this 2-hour Art Nouveau walking tour in Paris. Follow your guide through the 8th and 9th arrondissements and admire the beautiful Art Nouveau buildings for which the area is famous. Marvel at the Galeries Lafayette’s grand facade and gilded balconies, and gain insight into Art Nouveau design. Discover the Palais Garnier — a 19th-century opera house — and enjoy a drink in a traditional Art Nouveau brasserie. Your group size is limited to eight people to ensure a more personalized experience.